It’s been a long time since I’ve posted any data analysis of my Metadata MOOC… so to the 5 of you who were looking forward to hearing more about it, I apologize. But I’ve started thinking about this again. For one thing, I’m collaborating with colleagues on 2 projects making use of data from the MOOC. I’ll report on those projects, when there’s something to report. For another thing, I’m trying to teach myself to use Tableau, and here I have this nice dataset to futz with, that also might provide some interesting findings. And yes, I know the figures below are from Excel… what can I say? My desire to report findings has outstripped my knowledge of Tableau. Do you intend to earn a Statement of Accomplishment for this course? How committed are you to earning a Statement of Accomplishment for this course? 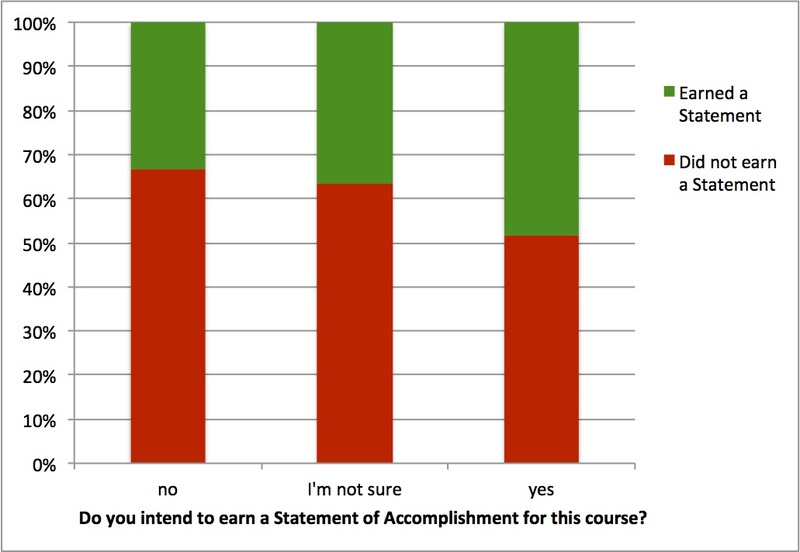 What I wanted to know was, what percentage of students who set out to earn a Statement of Accomplishment actually did? As I’ve written before, a total of 1418 students earned a Statement of Accomplishment. Earning a Statement was based on an arbitrary cutoff: prior to the start of the course, I set the criteria for receiving a Statement of Accomplishment as: completion of all graded assignments, and achievement of at least 80% overall. 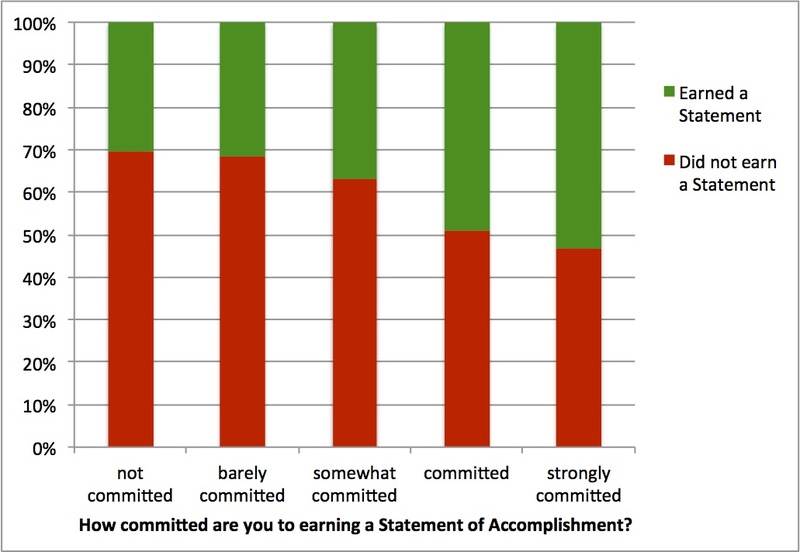 Unsurprisingly, more students who intended to, and were strongly committed to earning a Statement of Accomplishment, did so. On the other hand, around half of students who were committed or strongly committed to earning a Statement did not. Though actually that’s also unsurprising, given the high dropout rate for MOOCs. Life intervenes, you can’t always finish what you start, etc. What did surprise me, though, was how many students who had no intention to, or were only weakly committed to earning a Statement of Accomplishment, also did so. I’m not sure how to interpret this. Was the course too easy, so that students who went into it with little commitment could just sail on through to a Statement of Accomplishment? Was the course so awesome that students were just compelled to finish, and so earned a Statement, despite their initial intentions? I don’t know. Further research is clearly needed. Into my awesomeness. In all seriousness, though, this is one of the big issues for MOOCs: Why do students drop out? And how can we staunch the flow? And do we want and/or need to? Though I’m not aware of much discussion about the flip-side of that particular coin: Why do students do whatever the opposite of drop out is? Engage? And of course I don’t mean students who were engaged to begin with; I mean, why do students who intended to lurk, engage? I suspect there’s research on lurking and engagement in online communities that could inform such research.